The New England-based startup delivers medications and coordinates refills and renewals. Amazon broke the news Thursday that it is acquiring virtual pharmacy PillPack. With this, the online retail giant that has made itself famous for “one-click shopping” for consumer goods is positioning to expand its services to include prescription medication. While terms of the deal have not yet been released, TechCrunch is reporting that Amazon paid just under $1 billion for the startup, citing sources close to the deal. The New England-based startup delivers medications in pre-sorted dose packaging, coordinates refills and renewals, and ensures that shipments are sent on time, according to a statement. The service targets people who take multiple daily prescriptions. Originally founded in 2013 with the idea of pharmacy visits, the company has raised around $100 million in funding. Customers using the platform pay a monthly service fee, which is often covered by insurance companies including several Medicare programs. Amazon has shown an interest in selling prescription medication online before. In October CNBC reported that the company was in the final stages of drafting its prescription drug strategy. Amazon wasn’t the only retailer to take an interest in the virtual pharmacy startup. 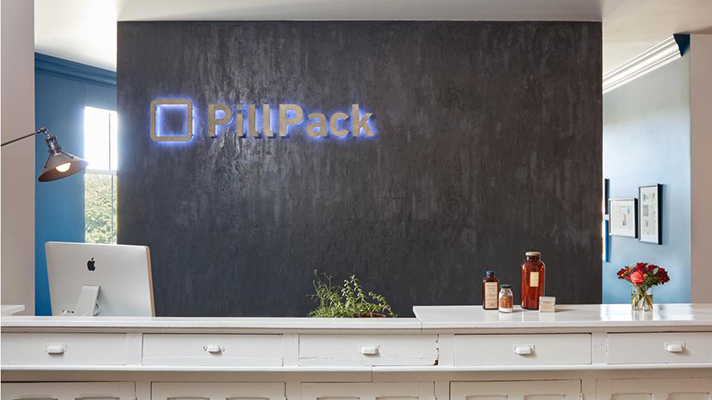 In the spring, rumors were circulating that Walmart was in talks to acquire the PillPack, with CNBC reporting at the time that Walmart was also offering less than $1 billion for the startup. It’s no secret that Amazon has its eye on the healthcare space. In January it announced a partnership with Berkshire Hathaway and JPMorgan Chase to build out a nonprofit healthcare company that, for the time being, will focus on the companies’ employees. Last week the partners named Atul Gawande, MD, as CEO and announced that the nonprofit will be based in Boston.